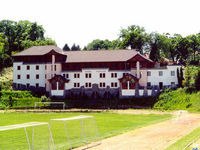 You can find Hotel Fonyod at a leisurely two hours driving away from Budapest, Hungary. You have only to take the international higway M7 to Fonyód, a little mediterranean-like town. The InterCity express trains also stop there. The hotel itself is situated on the side of the Old Hill, the one and only hill at the southern shore of the lake Balaton. -A very quiet, peaceful, mountanous-like environment. -It is centrally situated in the town Fonyód. Only two minutes to walk to the train station and the bus-stop. -From the terrace of the hotel you can admire a panoramic view of lake Balaton that you will never forget. -The shore of the lake Balaton (the beach, and the ship and the yacht harbour) is in a 5-minute walking distance. -Bordering the hotel is a national park and a pine forest with walking paths. -possibilities for various leisure programmes like fishing, sailing, body-building, hunting, riding etc. -other cultural programs possibilities: folklore-programmes, sightseeing, theater, concerts etc. -Direct acces to a sport-hall, international class "A" (licensed for organizing international sporting events). 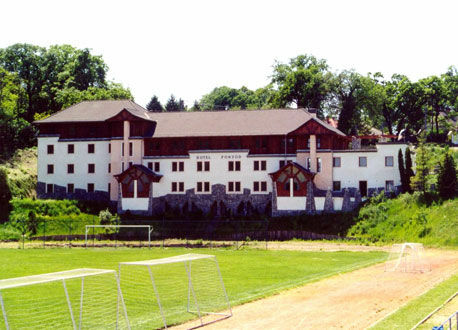 The sport hall has place for 800 people. In case of organizing concerts, there is place for 1500-2000 people.